A rare glimpse of immigrant life on “Quarantine Island.” Immigrants held on one of the quarantine islands, Hoffman, or Swinburne, located off the coast of Staten Island, New York. 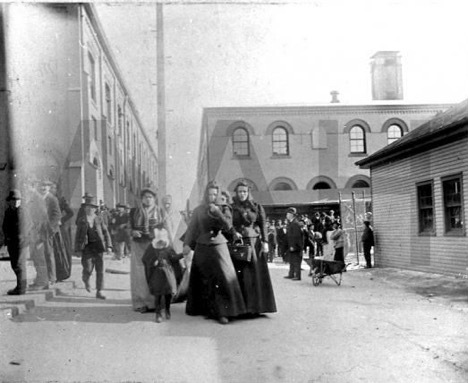 Immigrants arriving to New York by ship during the late 19th and early 20th Centuries were held on Hoffman, or Swinburne Islands; Quarantine Islands, before passing through Ellis Island, if they were determined to be carrying disease. There are those individuals whose life’s work stands the test of time. Alice Austen is one of those individuals. Elizabeth Alice Austen was born on St. Patrick’s Day in 1866. A first of her kind, she has been described as a feminist, a photographer, a photojournalist, a humanitarian, an activist, an athlete, and a member of the LGBT community (Monger, 2017). Alice received her first camera from her uncle Oswald at the young age of ten years old and her love affair with photography evolved immensely throughout her life. Her life’s photography of more than 8,000 images captured everything from women riding bicycles, a new sport from the Bahamas, called tennis, to her family life. She also captured rare glimpses of immigrant life in her photography. Many of her images represent a time in history that is still relatable to today’s world. Alice Austen grew up wealthy, with all the luxuries a girl could ask for on her grandfather’s property called, “Clear Comfort.” A perfect place to raise a child, the historical home was Alice’s photography site for many images of friends, family, and even her pet pug named Punch. Alice’s father abandoned her mother when she was pregnant, therefore, she was not familiar with her paternal side and dropped her father’s name. Though not an ideal situation, Alice’s grandfather welcomed her to call Clear Comfort her home (http://aliceausten.org/her-home, accessed March 18, 2018). Clear Comfort was a charming farmhouse originally built in the late 1600’s, purchased in 1844 by Alice Austen’s grandfather, John Haggerty Austen, and had extraordinary views of Brooklyn, Manhattan and New Jersey across the Narrows waterway. Clear Comfort still stands today, presently, as The Alice Austen House/Museum (https://www.nps.gov/places/elizabeth-alice-austen-house-clear-comfort.htm, accessed March 12, 2018). Alice Austen was not content with the frills and luxuries of high society Victorian life. She yearned for purpose and often abandoned the constraints of high society, and societal pressures (Grow, 2016). She enjoyed riding her bicycle, and climbing to higher ground, hoping to capture a great shot on her camera, and didn’t care much if her ankles were exposed. Alice found purpose in her photography, she not only captured a time where Staten Island, New York was considered a vacation retreat for the wealthy, but she also captured glimpses of the challenging world of immigrants in hopes of coming to America for a better life. She traveled to Manhattan and captured common life throughout the city (https://en.wikipedia.org/wiki/Alice_Austen, accessed, March 10, 2018). She photographed children selling the newspaper, street sweepers, street vendors, and people from all different walks of life. During this changing time in America, immigrants arrived on ships to the New York Harbor and had to pass health examinations on Hoffman and Swinburne Islands before allowed entry onto Ellis Island. These islands were coined “Quarantine Islands” due to the many immigrants quarantined, sometimes for months, falling ill to disease. Once deemed well enough, immigrants were permitted to leave and pass through to Ellis Island. Hoffman and Swinburne Islands were visible from Staten Island’s South Beach, and Alice made it a mission to travel to these islands, with heavy equipment in tow, sometimes more than fifty pounds, wanting to capture glimpses of immigrants and ignoring risks of exposing herself to disease. “Alice Austen House.” n.d. Accessed March 18, 2018. http://aliceausten.org/her-home. “Alice Austen.” n.d. Accessed March 10, 2018. https://en.wikipedia.org/wiki/Alice_Austen. “Elizabeth Alice Austen House–Clear Comfort.” n.d. Accessed March 12, 2018. https://www.nps.gov/places/elizabeth-alice-austen-house-clear-comfort.htm. “Interpreting LGBTQ History at the Alice Austen House.” Monger, Janice. Accessed March 10, 2018. http://forum.savingplaces.org/blogs/special-contributor/2017/10/06/interpreting-lgbtq-history-at-the-alice-austen-house. “Rediscovering Alice Austen: A New Woman for a Modern World.” Grow, Krystal. Accessed March 10, 2018. https://www.americanphotomag.com/rediscovering-alice-austen-new-woman-for-modern-world. This entry was posted in The Alice Austen House and tagged 1896, 19th Century, Academic Service-Learning, Alice Austen, Alice Austen House, Alice Austen House Collection, glass plate photography, Immigration, Photography, Quarantine Island. Bookmark the permalink. ← Does the Melting Pot Still Meld in 2018?